On September 1st, Chick-Fil-A is giving away a free three count order of chicken strips if you come in wearing at least one item of football clothing! Keep your pet safe with this free ASPCA Pet Safety Pack. Get a Free pack of Post-its with Digilake Logo. Try Purex's new fabric softener. Grab a free recipe book entitled "Feed Our Kids Well", from Ragu. Get free movies from Car Angel. Kids looking for something to do? Print your own Paper Toys. McDonald's id giving away free chicken sandwiches with the purchase of a drink, print a coupon! Everybody loves Monopoly, but what do you do when the money is lost?? Print your own official monopoly money, of course! Grab a sample of Neutrogena Oil-Free Acne Wash Pink Grapefruit Foaming Scrub. Nurtured Pets wants to send you a sample of their "Anti-Lick" strips to stop licking and chewing of anything! Our friends at Walmart are sending out full size rolls of Scott bathroom tissue! Sign up for the BORBA Skin Care catalog and they'll send you a free gift too! Calistoga Water wants to know which type of water you prefer... sparkling or still? Take their quick quiz and they'll send you a coupon for a free four or six pack of any calistoga beverage. Do you have a new puppy? Eukaneuba would like to send you a new puppy pack, including a puppy training DVD! Christina Aguilera has a new perfume "Inspire" grab a sample. Fiber 35 Diet wants to send you a free FitSmart bar! We also have a new poll in our suggestion box! Simply click on "Suggestions" in the top menu bar - Vote Today!! 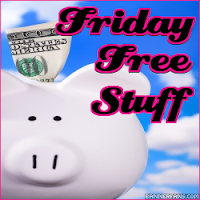 Thanks for posting the Friday freebies! I can't wait for the samples to come rolling in!